Jamie Walden is glad to see Anders Behring Breivik held morally responsible for his actions and that the blame is not being transferred to any “root causes” of the atrocities in Norway. The Breivik massacres must surely put an end to the quest for “root causes”. The self-generated evil perpetrated by this grandiosely deluded non-entity cannot and is not being put down to any “root cause”. The world has not done anything to Breivik which could rationalise his actions and he was not left without any choice but to do what he did. However that might seem rather obvious. Conversely following the attacks of September 11th 2001 many decided that it was not a case of self-generated evil; in fact the idea of evil itself became unfashionable. Instead “root causes” were sought. A meme floated around which asserted that if someone were to do something so awful, they must have a justifiable gripe with those who were the targets of the assaults. Various attempts have been tried. America should support Palestine instead of Israel; the West should not interfere when dictators in “Muslim land” enslave the populations there; we should feel guilty about global economic disparity etc. All of the attempts to show how we brought it on ourselves were nonsense. Terrorists are morally responsible adults, who are not “caused” to do what they do, but they do it themselves because they decide to. They could have decided not to, but they didn’t. The endless search for the “root causes” of Islamic terrorism came from a deeply embedded racism in Western society about non-Westerners. The non-Westerner was being considered an inanimate object which could not screw up as a culpable being itself, but could only screw up if “caused” to by the West being mean to them. This subtly racist narrative cast the Westerner as a morally responsible adult and the non-Westerner as a boomerang. The Westerner throws the boomerang, and being a boomerang it comes back and hits the Westerner in the face. Of course it is not the boomerangs fault; it is after all an inanimate object without moral responsibility of its own. The Westerner was to blame- he should not have “caused” the boomerang to hit him in the face. This ‘classic piece of leftist pathology’ as Andrew Sullivan calls it, was no more on display than when Robert Fisk wrote about being roughed up in Afghanistan for no reason other than being a Westerner. Yet Fisk said that ‘I understood. I couldn’t blame them for what they were doing… [their] brutality was entirely a product of others’. According to Fisk they were ‘innocent of any crime, except that of being the victim of the world’. Sullivan pointed out that Fisk was arguing ‘someone- anyone- is either innocent or guilty purely by racial or cultural association. An average Westerner is to be taken as an emblem of an entire culture and treated as such. Any random Westerner will do. Individual notions of responsibility or morality are banished, as one group is labelled blameless and another irredeemably malign’. This pathology cannot feed on the recent acts of terror in Norway. Breivik does not have the hallmarks that would relinquish him of his responsibility. He is not a victim of anything. He is not from the third world. He is from a consumer society, not a poverty stricken quaintly spiritual one. Quite rightly he is being blamed for his own actions. These events may give those in their endless masochistic searches for a “root cause” the jolt they need to remember how moral blame and responsibility should sensibly be attributed. It is not because the West are western that we are the cause of much evil – it is because we are in the greater position of power, and have forgotten our responsibility in this role. Admit it, terrorists usually directly blame the acts of the West. Even if you disagree that this is truly to blame, until we can defeat these arguments, we merely lend cause and proof to their rhetoric. 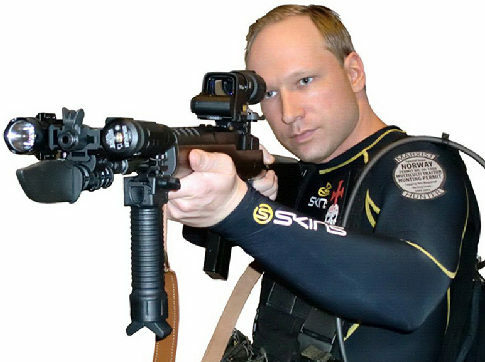 Breivik is a totally different case – you claim that he is not a victim of anything. I agree. But he would not. He would quite probably view the white western world as imminent victims of a Muslim invasion… This view itself is one that must be answered, and ignoring root causes will merely enable others to take a similar point. It does not matter whether someone HAS a grievance – it merely matters that they FEEL that they have a grievance. You will be glad to know Morgan that in the interest of adversarial debate I disagree with you. I have to warn you though that I am away and internet-less tomorrow onwards for a few weeks, so I may not be available to read or reply to whatever you may or may not comment in the future here, so my apologies if you did want to respond again. I can see that I have written quite a lot, so maybe there is enough to annoy you there for now anyway! Firstly we are talking about two completely different things. You are talking about reasons given by terrorists for acts of terror, whereas I am talking about “causes”. A cause implies a necessary link, as Robert Fisk implied in his piece about being beaten up in Afghanistan. A cause is a specific term. So if A causes B, B necessarily has to follow A, it could not have done otherwise. There was a perfect example of this pathology of the excuse making industry that I annoyingly couldn’t find for the article, but know roughly from memory. A prominent public figure (I’d be grateful if anyone who recognises this and knows who said it could remind me) said something like the following “the September 11th hijackers did it for the same reason some people jumped out of the windows of the World Trade Centre whilst it was burning- because they had no choice”. It was a complete denial of responsibility and the assertion that they had necessarily been caused do something evil to the same extent that being trapped in a room full of smoke and fire causes you to commit suicide in the quickest possible way. In your opening sentence you say the West are the cause of much evil, by which I take it you mean that evil is done against the West because of things the West has done previously and how this causes those evil things to come back at the West. But the West is not the ‘cause’ as the distinction I am making in this paragraph and I assumed was clear in the article should show. Now with that distinction in mind, by saying that until we defeat their arguments we ‘cause’ their rhetoric, you are denying that they could do or think differently without the West prompting them to. Which is a suggestion my article was a response to. I was not saying terrorists do not give specific reasons for what they are doing. I was saying that a terrorist having a gripe with the victim’s society does not mean that society has “caused” them to do the attack. Thus the next stage of my argument would be to say that the victim’s society does not make concessions to these demands, because those demands are not why the acts of violence are occurring. If we conceded to all of Al Qaeda’s demands or comprehensively proved all of their arguments wrong this would not stop a thing. Take item three on the charge sheet against the West in al Qaeda’s 1996 declaration of war against the United States. The perceived crime of the West is that they put an end to the genocide going on in East Timor (where mainly Portuguese speaking Christians live) at the hands of Indonesia. Contemptibly the West had supported Indonesia, but then it reversed this stance with administration changes and so forth. Bin Laden says that we must be punished for taking something away “Muslim land”. Sergio Vieira De Melo the great U.N. peacekeeper oversaw this. His next job was in Iraq. The U.N. headquarters in Baghdad were blown up by Al Zarqawi’s Al Qaeda in Mesopotamia forces, killing De Melo and many others and gave the East Timor affair as their reason. Now what part of not convincing Bin Ladenists in argument that we were right to halt the genocide of the Timorese and bring East Timor to independence ‘caused’ such a great act of murder and barbarism? You also say that terrorists usually directly blame acts of terror on the West. Perhaps you will have noticed the relatively few terrorist attacks since September 11th 2001 in the West, compared to say, Pakistan or India. Jihadism is self-generated evil. Jihadists have spent far more time killing other Muslims in Pakistan and Hindus and Muslims in India than they have spent killing Westerners in the past decade. The Islamist Sudanese regime has sodomised black African South Sudan for decades (many of whom are Muslim). Buddhists in South East Asia get far more terrorism that the West does. There have been hundreds of attacks in Pakistan, while very few comparatively in North America and Europe since 2001. If Jihadism commits terrorist attacks all over the world against a variety of different nations, races, civilisations and religions full of innocent people, then why when an attack is directed at the West did the West ‘cause’ that attack. Surely the evidence suggests that Jihadism is not ‘caused’ by the acts of terrorist victim’s societies but is coming from within the terrorists themselves, i.e. religious fanaticism and the sincere belief that the mind will survive the death of the physical body, coupled with irrational and unjustifiable hatred against anyone who disagrees with that religious disposition, because the religious texts that are believed in mandate such things. As I pointed out they are not causes at all, the Breivik massacre did not necessarily follow mass immigration of Muslims. It was not a cause. And how far do you debate the view? Sure there should always be political debate on immigration and we should try to prove Al Qaeda and Breivik-esque individuals wrong, but Breivik and Al Qaeda will not be convinced. Further, Breivik’s manifesto rants and raves about the Knights of Templar and other conspiracies. Do we debate against that, else be held accountable for ‘causing’ him to murder children? The white supremacist online forum ‘Stormfront’ has discussions about how the Breivik murders were a Jewish conspiracy. Do we prove that point of view wrong to the satisfaction of those who believe it, or else be held accountable as the ‘cause’ of any violence committed in the name of that point of view? Basically I think lazy received wisdom has allowed the phrase “root causes” to enter stealthily into discourse without being challenged. Nobody using it particularly cares what a ‘cause’ actually is, it is just a way of releasing the religious impulse humans have to feel like guilty sinners, by saying we are to blame for suffering, even suffering we are the victim of (note terrible weather being interpreted as punishment from God for human immorality as a religious example of rationalising your own suffering as your own fault). By ‘root cause’ they mean, whatever it was that annoyed the terrorist, which is an entirely different thing to a ‘cause’. A terrorist being annoyed about something does not ‘cause’ the violence, even if it is the reason the terrorist gives. And thus those who annoyed the terrorist were not the ‘root cause’ the violence. And thus addressing the thing is perceived as the ‘root cause’ of the terrorism will not necessarily stop the violence from occurring, because that thing was not the ‘cause’ of the violence in the first place, as the Salman Rushdie quote expresses better than I can in the case of bin Ladenism. You certainly believe in exhaustive responses, I can see that. I can survive well enough on this response for now. I don’t necessarily think we’re talking about two different things. While you claim that causes implies a *necessary* link, I disagree. I believe that the reasons *are* causes. That is the crux of it. I’m taking a view from grievance theory that, it is irrelevant whether the ‘disadvantaged’ in (i.e. international) society (i.e. Islamists) have or do not have a genuine grievance against the dominant (i.e. ‘Western’ – I take it we can agree these are the disadvantaged and dominant?) – all that matters is that they *believe* that they have a grievance. And until that belief is proven incorrect, in whatever way, the conflict will continue. I’ll confess I didn’t answer the Fisk point because… well, I disagree with the gentlemen. I disagree with the quote about the Hijackers having no choice. There is ALWAYS a choice, I’m not that deterministic, I don’t believe that they could not have acted otherwise. But I believe that the way they viewed the world, the way the world was constituted around them led them down a certain path, one that it was harder to break away from than follow, one that led them almost inexorably to violence. In the example of my opening sentence in my first reply, the West’s actions generated this path, one that they found themselves on, and had difficulty in breaking away from. I think that they still hold responsibility, and if I seemed to contradict that point then I should clarify. They are responsible for their actions, but we DO need to understand cause and effect, not merely label them as evil. I believe that making concessions, understanding why they are set on this path, those who do not break away, we can eventually break the cycle of violence. Not because we have directly and solely caused these actions, but because we have developed the path of their world by our actions. I could say Rushdie “caused” them by affecting their world. I do not believe he gave them no choice, I believe they keep responsibility, but he is in many ways the cause to their effect. Having said that, his writing was the effect of their actions. I do agree that there are sections of the Islamist movement that would not end – but by peacefully solving the Israel/Palestine conflict we could remove their propaganda material. I do have to say, I would agree that we ’cause’ their extremism by daring to kiss in public. We do. We get them angry. But, that is not to say that we shouldn’t do it. When fighting extremism, we must draw our limits. I will kiss who I want to in public. I will eat all the ham I want. Rushdie should publish his books. But we must understand *why* things are happening in order to combat them. This does not imply that we should alter our actions, although some compromise may need to be found. De Melo’s death was a tragedy. But again, it was cause and effect. We did ’cause’ his death, as in that if we hadn’t tried to stop genocide in East Timor he may not have died. But that is not to say, that we shouldn’t have stopped it, that we should let him die, or that we should not fight extremism in all its forms. Doubtless, fanaticism, irrational hatred and a belief in martyrdom and the continuation of the soul all provide contributing factors of extremism. I’m not denying that. But these specific instances are due to the *perceived* grievance they have against the societies you list. It may be real, it may be false – that doesn’t matter. All that matters is that they perceive it. On Brejvik, as far as Brejvik was concerned, his actions *did* follow mass immigration. He believed it to be a cause. Thus, if we are to defeat people like him, we must understand why he believed it was a cause. If he believed they would ‘take our jobs’ (to quote South Park… not as impressive as Rushdie but relevant), then we must show those tempted by extreme-right positions that this is incorrect. Take away their propaganda, we take away their power. Take away their cause, we deny them reason. In this, we do not have to think of ourselves as the cause. But we have to accept and understand what they believe, in order to understand. I do not agree with your analysis of the discourse – “root cause”, may, in some people, hold that opinion, but for example with me, I have no impulsive desire to feel to blame. I am trying to analyse root causes in an attempt to understand what has happened. If we understand what happened, we may prevent it in the future. We can try this by affecting their behaviour, or ours. We must try both. We must find compromise between extremes. My point is that “if it is the reason the terrorist gives”, then, as far as the terrorist is concern, *that* is the cause. It is the reason he did that. Addressing that may prevent a recurrence. However, we have to measure this against defending our own values (ham, mostly), and this I don’t deny. We have to defend our values against all forms of extremism. But in fighting them, it is crucial to understand them. If we merely label terrorists as insane, evil, devoid of responsibility… any of these things, we do no good. We must understand the complexities of cause and effect, to try and understand why the ‘evil’ was caused. I understand what you are saying about ‘causes’ meaning not only necessary and sufficient causes (the way I am using the word cause, and I should add that Fisk was using the word in my way and many others whom the original article was intended to be about, that is why my article is taking cause on their terms as having a necessary link), but also to mean ‘contributory causes’ as well i.e. if there is a presumed cause (a Western crime) of an effect (terrorist attack) and altering that cause alters the effect, it can be considered a contributory cause. It is obviously not necessary or sufficient, but it is a contributory cause. With that in mind many crimes may not have occurred if many innocuous things did not occur. For example, those connected with the Satanic Verses many not have been killed if the attacker’s alarm clock had not worked properly that morning and they had overslept. In that sense it seems to be obvious that the writing and publishing of the Satanic Verses was a contributory cause to the violence because no anti-Satanic Verses violence would have occurred if the book did not exist in the first place. You are also right to say that this does not mean the problem in the Satanic Verses affair was the existence of the Satanic Verses (although many pathetic commentators did take the line of appeasement and said that the novel was the problem) and that acknowledging that it was a contributory cause does not mean you are not on the side of Salman Rushdie, free speech and Western civilisation. However these are just specific cases. Islamist terrorism in general would occur no matter what the victims had previously done. Note my earlier paragraph on the often ignored massive amount of Islamist violence committed against other, not prominently Western, people and religions, such as against Hindus in India. I don’t think the West generate the path to Islamist terrorism; I think Islam generates that path. The fact that Islamism is not inherently anti-Western is shown by the heterogeneity of the victims of Islamist terrorism, i.e. from a salad of mostly not Westerners and the fact that it is inherently motivated by Islam is shown by the overtly religious motivations, reasons, writing and speeches of Islamist spokespersons and the fact that if you read the holy books they clearly offer justification for what Islamists believe. On the Islamists being disadvantaged (Islamists being distinguished from Muslims) it depends on who you are referring to. Osama bin Laden was far richer than the people killed on September 11th 2001. Many Islamists live in Britain, including those willing to commit violence, such as the July 7th 2005 bombers, who had the same living conditions as those they killed. It is simply not the case that Islamists are misguided victims of Western greed who live in the third world. They live in Leeds, like the July 7th 2005 bombers, they appear on BBC current affairs shows like Anjem Choudary, they are from multi-millionaire families like bin Laden, they are rich and famous pop singers like Yusuf (formerly known as Cat Stevens). You say we should make concessions. I disagree. We should not make any concessions to Islamism. They are completely in the wrong. I think the September 11th 2001 hijackers and architects are evil. I know it is unfashionable to use the term, and people like to sneer at George W. Bush using the term. However it is a necessary term, not a frivolous reductionist one, which is significantly influenced by the modern political philosophy of Hannah Arendt. It is not a simple concept or a naïve one or a Christian one, but a necessary and accurate one Arendt used to describe the 20th century totalitarianisms. The evil of some people is self-generated, such as that of violent Islamists like the Taliban and Al Qaeda. Radical evil, as Kant referred to it, comes from human nature, not from social or economic injustice. When I say bin Laden is evil, I am not ‘merely label[ling]’ him as such, I am being quite precise. Some bad things are done, such as Breivik murdering children, and the Taliban treating women like farm animals, because they are in themselves doing something wrong, motivated by evil within themselves, not by any heartless big business or trigger happy Western politician.